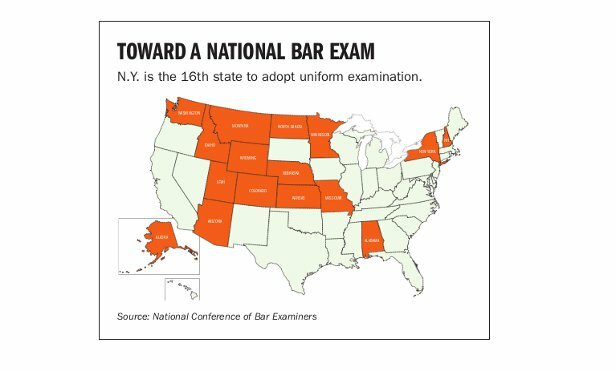 The Uniform Bar Examination (UBE) becomes a reality for New York bar takers in July 2016. The UBE is a two day exam, administered twice a year on the last Tuesday and Wednesday of February and July. 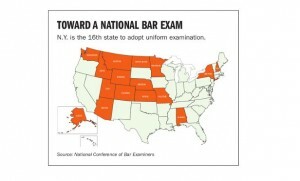 The UBE is developed by the National Conference of Bar Examiners (NCBEX) and is currently administered in 21 states. Each state sets its own passing score, ranging from 260 to 280. New York has set its passing score at 266. In the morning of day one, two Multistate Performance Tests (MPTs) are administered. For each MPT, you are presented with a library of material and are required to write a specific document like a complaint, a contract, a will, or an office memo. It is critical that you follow the instructions not only as to the type of document but the format required. In the afternoon of day one, you are required to write six essays. This is the Multistate Essay Exam (MEE). These essays are generally single issue (although they may have more than one issue), and each should take 30 minutes to write. Areas tested vary on each bar exam, and may include business associations, federal civil procedure, conflicts, constitutional law, contracts, criminal law and procedure, evidence (Federal Rules of Evidence), family law, real property, torts, trusts and estates, and articles 2 and 9 of the UCC. Day two is all about the Multistate Bar Exam (MBE). There are 100 MBE questions in the morning, then 100 more in the afternoon. These multiple choice questions will very often have a best answer rather than a right answer. Subjects tested are federal civil procedure, constitutional law, contracts, criminal law and procedure, evidence, real property, and torts. It’s important to answer all the questions on the MBE, even if you are running out of time and just have to guess, because wrong answers are not counted against you. The scaled score required to pass the MBE is 133. New York also requires that candidates for admission to the bar take the New York Law Exam (NYLE). First you are required to complete a 15 hour online New York law course, which should be available in April 2016. This course will cost $27 (for New York residents) and will be available on demand. Once you complete the NYLE, you are required to complete a 50 question multiple choice test on New York law. This two hour open book test is administered online, and you must get 30 out of the 50 questions right to pass. The test will be administered four times a year, and the first chance to take the test will be in May 2016. The New York Bar Examiners website has information on the UBE, the NYLE, and other requirements for admission to the bar. The Law Library has a research guide on the bar exam. It currently reflects the bar exam as it will be administered in February, but will be updated to reflect the switch to the UBE. The NCBEX has some sample MBE questions, MPTs and MEE essay questions available at no cost. They offer sample MBEs for $50, and a number of MPT and MEE sample questions and answers that the Library is purchasing and will make available on reserve later this semester. The Library has several books with sample MBE questions—ask for them at the circulation desk. Bryan Williams from the NY BOLE gave a presentation about the UBE at Pace Law School on Feb. 1, 2016. A recording is available here.